"How do we prepare students to face uncertainty? We start by giving them lots of structure." 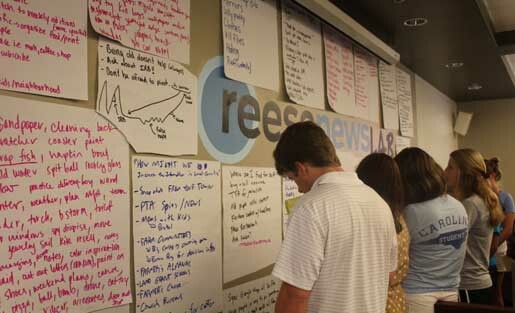 John Clark has directed the Reese News Lab since July 2011 and leads courses in entrepreneurship for the School of Journalism and Mass Communication as well as UNC’s minor in entrepreneurship program. Clark has extensive experience as a leader, programmer, research and development manager and startup founder. He is the former general manager of WRAL.com, led the early development of the nation’s first local television news application on mobile phones and co-founded News Over Wireless, now StepLeader Inc. Clark also spearheaded the development of an experimental datacasting service to deliver news and information through digital television subchannels. In 2001, he co-founded appcomm, inc. a local Internet services company. Clark has served on the North Carolina State University Student Media Advisory Board and was an adjunct lecturer of communication at Campbell University for eight years before returning to school for an M.B.A. Follow him at @johnclark.